Take a break from exploring the aquarium by relaxing with a beautiful sea view in our Blue Reef Cafe, where you can treat yourself to a range of drinks, snacks, and meals. We cater for the really little ones, too. High chairs can be provided for the future generation of marine biologists. We also have a microwave available for parental use. 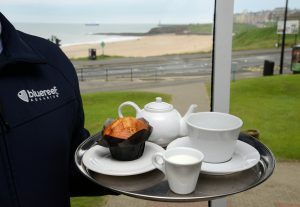 Our cafe is open to everyone, so whether the kids are building sandcastles or you’re having a cute stroll along the beach, you’re always welcome to pop in for a cuppa or a bite to eat. Oh, and we always recommend taking a little peak at our fascinating creatures too! Once you’ve enjoyed a little rest-bite, swim on over to our gift shop and treat yourself and the family to a fin-tastic souvenir. We are extremely committed to reducing single-use plastic, which is why our cafe no longer uses plastic lids, straws, or cups. We’re always trying our hardest to work with suppliers on their single-use plastic in our supply chains. You can read more about our commitment and how we’re keeping our marine wildlife safe here: Plastic Free Tynemouth.